The shadow box I’m making out of cherry plywood needed some hardwood edging to hide the ugly plywood edges. I ripped strips of cherry about 1/8″ thick. They were slightly wider than the thickness of the plywood. This way, you don’t have to worry about having the edging perfectly flush as you glue it to the edges of the plywood. After the glue was dry, I pulled out my Stanley 101. It’s a small plane a little longer than 3″. It’s a cute little thing. But it comes in handy for light tasks like this. Lee Valley sells squirrel tail palm planes (like the Stanley 100) and a “Little Victor” plane that would do the job. They also have the Kunz version of the Stanley 100. 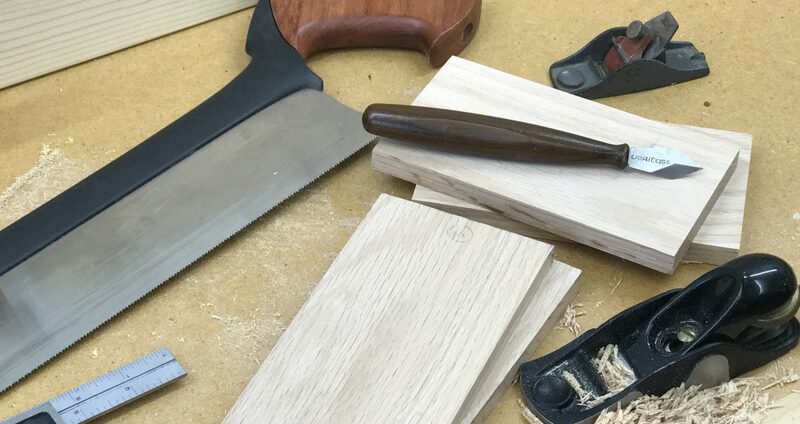 Why didn’t I use a standard block plane, or for that matter, a bench plane? Well, I actually started to, but they felt too heavy and clunky for this light trimming task. And the block planes have a lower blade angle that was causing some tearout. Back to my little Stanley 101. Notice that there’s no blade adjuster on this tiny plane. I set the blade by inserting it until it bottoms out on the workpiece then tighten the cap. See that little nubbin on the back end? I don’t know this for a fact but I believe that’s there to allow you to retract the blade with a light tap of a hammer. The nubbin protects the edge of the casting from being damaged. To advance the blade, lightly tap the front end of the plane. It sure beats loosening the cap and trying to make minute adjustments by hand and eye. That’s an exercise in frustration. The technique I use to trim the edging is to keep most of the plane riding on the plywood with the blade engaging the edging. This way, as the edging is trimmed, the plane kind of “self levels” the edging. Just keep an eye on the edging and use your fingers to gauge when it’s flush before you cut into the plywood veneer. There’s a fine line (a shaving’s thickness) between flush and too far. After trimming both sides of the edging flush, I needed to smooth the face of the edging. It still had saw marks on it from ripping it to thickness. I clamped each piece in my face vise and used my No. 3 smoother. I quickly discovered I had difficulty keeping the plane level. I have a tendency to lean the plane to port side, leaving a surface that’s not square to the face. To help me keep the plane square, I used a Veritas Jointer Fence. It attaches to the cheek (side) of the plane with strong magnets. It’s offset so that the entire width of the blade can engage the workpiece. You can make a jointer fence by rabbeting a straight-grained piece or hardwood or you can use a dense plywood like Baltic birch. The idea is to provide a bearing surface that rides along the face of the workpiece keeping the plane square to the face. It works like a charm. A few swipes and the edging was nice and smooth. Posted on October 8, 2013 October 7, 2013 by Randy MaxeyPosted in WoodworkingTagged craftsmanship, Hand Planes, Woodworking.